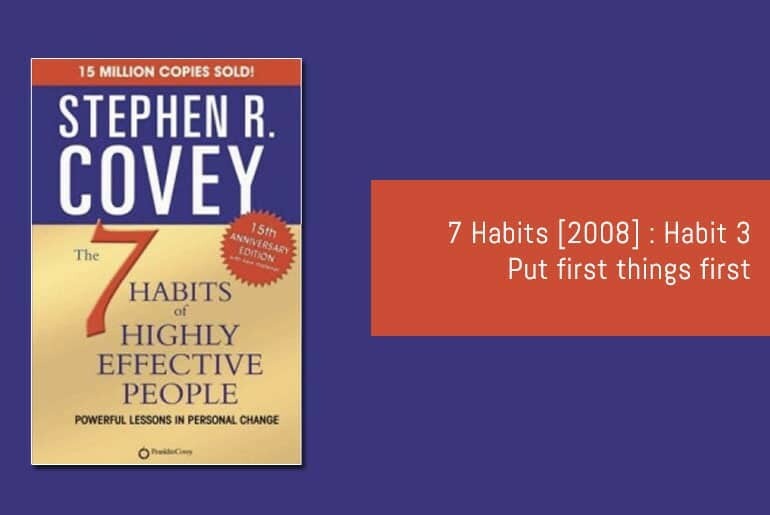 I’ve recently revisited the “7 Habits of Highly Effective people” 6 years after writing this post. All posts in the new series are listed here or you can read my all of my 2008 take on the 7 habits here. Habit 3 begins with looking back over the previous two habits providing a re-cap of what we’ve learned so far. Habit 2 – The vision to see the results and potential (The first creation). Lead from the right [brain]. This habit centres mainly around the notion that personal effectiveness equals a good work/life balance (although that’s a rather simplistic way of looking at it). Covey uses a time management matrix to illustrate his point. Apparently, in order to be personally effective, we need to spend most of our time in quadrant 2 – “Important but not urgent”. A lot of this chapter revolves around time management, but to be honest it doesn’t cover it in enough depth to be of any real use; but them I could just be saying that because I’ve done a lot of reading around the subject and for a novice it would be considered adequate. Habit 3 looks at goal setting again for each area of your responsibility (home, work, relationships etc.) and ensure goals (our first things first) are balanced to enable us to move into quadrant 2. Covey discusses roles, delegation and learning to say “No” which again I’m quite familiar with so it didn’t have a hige impact on me and again I found Covey’s approach quite simplistic but it did make for a nice refresher. To be honest, not a lot! I did like the time planner that Covey produced – which is actually quite similar to one I came up with over 2 years ago and it’s given me a couple of ideas of how to revise it, but I think I’ll keep managing myself the way I currently am – it seems to be working for me at the moment! Er… Not a lot! I think that I’m pretty “effective” anyway but I will examine how I’m handling things and try to determine what quadrant they’re fitting into. So far, so good as far as Habit 1 is concerned. I’m still being (or at least feel I am) more proactive and this is making me a lot happier in terms of my outlook towards certain things. Habit 2 – Whoops! I haven’t been able (or maybe that should be willing) to do anything about this yet – and I’m not sure what to do about it. All of the habits hinge on the previous habits learned so I can’t really skip this one. One problem is that I have been MadCrazyBusy at work recently so I’ve not had time to relax and think about it as much as I’d want. I’ve got a week off at the end of the month so I’m hoping this will provide me with a window so that I can spend some quality time with myself and work out my direction… fingers crossed! Why Not Read The Updated Version? “Also, I think that his definition struggles in that what is urgent for me may not be urgent for you.